Thanksgiving just past and we are now in what some call “the season of giving.” Winter is a great time to reflect upon who we are, where we are, what we’ve accomplished, and to celebrate our lives and the lives and stories of others. 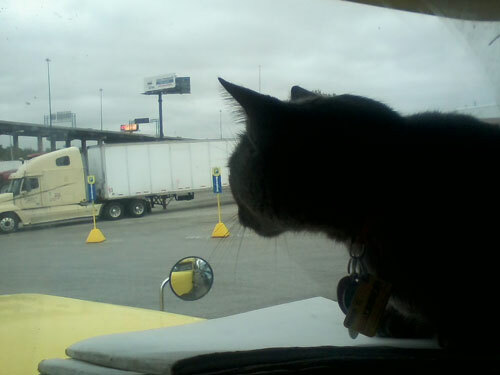 Let us give you the story of Gary, an 18 wheel trucker and his cat Gus. Their dear friend LaVonna is the feline/human matchmaker crucial to this story. This is what LaVonna has to tell us about highway adventures of Gus and Gary. It all began when my own gray cat disappeared one Summer. She was gone for so long that I thought she was gone for good. Gary, my friend, a truck driver, accompanied me to the shelter several times looking for “Stormy” but we never found her there. On one of our trips we saw a Stormy-look-alike named Gustav. He was a young beautiful Russian Blue cat (and still is as you can see) so I decided to adopt Gus (also called Gus Gus) for my own to replace my beloved Stormy. After a few weeks, guess who returned? Stormy! But it was not to be a feline match made in Heaven between she and Gus. The two of them collided and would not become friends. 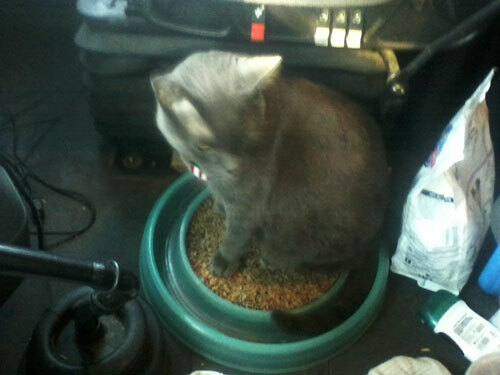 So, Gary, being the kind-hearted animal lover he is, decided to take Gus with him on his journeys in his 18-wheeler. 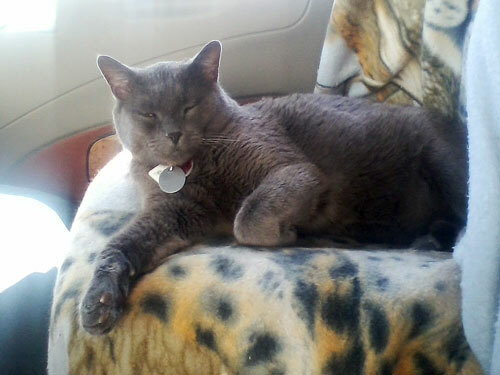 Gus rides on the dashboard of the truck watching the scenery whiz by, and keeping a sharp feline eye on the road. I think he has been in most of the 48 states and Canada. 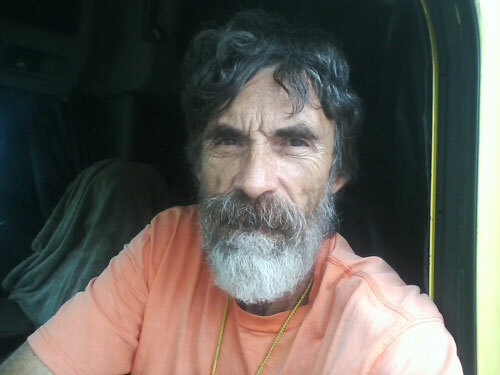 Gary contacted me just this Fall to tell me that last year Gus disappeared at a truck stop. Gary had to continue on his journey as he was “under a load”, but worried the entire time, sick at the thought that Gus could become a coyote’s dinner. But when Gary returned after a couple of weeks, other drivers told him they had seen a gray cat around. Gary searched for Gus and when he found dear Gus he was one very flea and tick infested feline. It didn’t matter! Gus Gus was back in his arms and on the dashboard once again. Gary also told me that Gus does NOT normally like to go to the groomers but I think this particular visit to the groomer was an exception! Gary could talk your arm off telling you tales about Gus Gus and all the many adventures they have had together. Gary has had this trucking buddy now for over 12 years. Gus Gus has become a bit of a “Folk Hero” across the highways. Cat Faeries is urging Gary and LaVonna to start a blog with the road trips of Gary and Gus Gus! If they do, you dear readers, will be the first to know! If you wish to encourage them you may write to us and we’ll forward your message. Send it to catfaeries@catfaeries.com and put Gary and Gus in the subject line. Happy Trails to all and wishes for a peaceful holiday season! Do You Have a Healing Kitty in Your House? It was the final hot summer before the shelter in Florida closed. The adoption area was filled with adult cats and the unavailable kittens were in a separate building not open to the public. The one room building also housed the washers and dryers for the entire shelter. As you might imagine, the A/C couldn’t keep up. Two walls of cages were full. The remaining kittens lived in plastic carriers stacked on top of each other. Most of them just had numbers on their tags. They didn’t get names until they were moved to the adoption area. 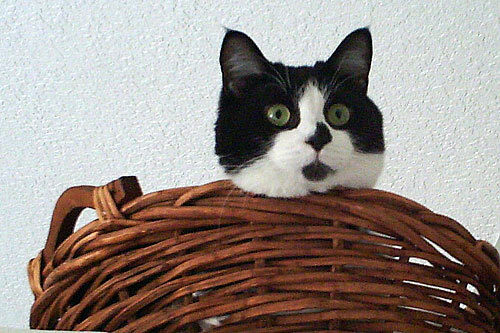 But one crate near the washers held a black and white kitten with a name – “Weety”. He was an owner surrender and had probably been named by a child in the family. Whenever I went to do laundry I looked for him and said “Hi Weety”. One day I went to check laundry and Weety was gone! There was only one possible reason. He was sick and had been transferred to the hospital area. The Green Room (named for the color of the walls) was even smaller than the holding area. Most kittens who were sent there had upper respiratory infections. They were treated with antibiotics and, if they survived, sent back to the holding area. When I found him he was so dehydrated he didn’t have enough moisture in his body to sneeze. Luckily, the surgery/clinic area was closed that week. Normally sick animals were not allowed there. I gave him SQ fluids, canned food and a towel lined bed made from a plastic hospital basin. He was SO HAPPY to be in a clean, comfortable place. I’ve never seen a sick cat react with such intense affection. At the end of the week I took him home to finish antibiotics and make sure he didn’t have a relapse. Of course, by then I was totally in love so I formally adopted him. Later that summer I had a respiratory infection myself. Whenever I was lying down Weety would sit on my chest and purr. (He still does this whenever I am sick.) I don’t think there is any more relaxing sound than a cat purr. 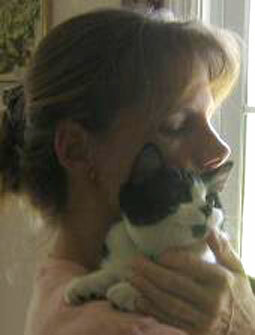 But, it is a misconception that cats purr only when they are happy. They also purr when stressed (e.g. visiting the vet) and when they are sick. This is not surprising since the 26 Hertz range of a cat purr promotes tissue regeneration. It may even heal and strengthen bones. Weety is very sensitive and always seems to know when I need some healing kitty energy. I like to think he is returning my earlier kindness to him. I recently read an article by Charles Snowden, a professor of clinical psychology at UW Madison, and the lead author on a new study of the effect of music on cats. He took his music and his team to homes with cats to test their reactions to the ranges, tempos and sounds. Then he played classical music, and found the felines responded more favorably to his specialized cat music. Snowden seemed to suggest in his article that it’s “us” humans who pick out the music for our pets and assume they are going to like it. He states most studies don’t offer any concrete evidence as to what the effects of music are on animals and hopes to close the gap with more facts through his research. I am a professional singer, songwriter and performer for over forty years – and I love animals! I have also done a study on the effect of music on cats – at a local animal shelter. I composed music of different instruments, ranges, tempos and sounds. I played my music in the cat room where 15 to 20 cats awaited adoption. (These were abandoned, or abused cats.) I also played classical and country music to see if there was a difference in the response from the cats. The study went on almost daily over a three year period and I found the felines responded more positively toward the music I composed. They actually gathered near the speaker! I agree with professor Snowden that more research on the effects of music on animals needs to be done. I also know this…music has profound effects on the brain which in turn affects mood and behavior. We humans place a lot of our own emotions onto our beloved pets, which is why we think they’ll love a certain kind of music when we leave the house. That’s understandable. Mood Music for Cats (and Cat Lovers) isn’t “clinical” research music, however it offers specific benefits for calming and relaxing through ranges of tones and instruments that are pleasing to the ear for both humans and felines. Sure, I use catchy song titles such as “Tuna Sonata” or “Catatonia” because I like to keep things light and fun! But the music has been tried and true and cats seem to love it! 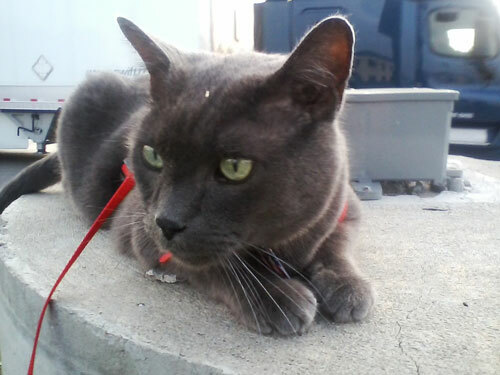 Here’s what a Cat Faeries customer told us about the music from Mood Music for Cats (and Cat Lovers): A Ball of Twine. I recently adopted a shelter cat who had been mistreated. My new cat had been hiding in the closet, terrified of her new surroundings. The closet is in the same room that my computer is in. I found your website and I found A Ball of Twine, and saw that I could press a key to listen to a sample. I kept hitting the key and playing the sample over and over. After a few minutes my new cat ventured out of the closet ready to explore her new home! Thank you!